How many animals are there, how many of them suffer at human hands, and how can advocates use this information most effectively? During a talk at the national Animal Rights conference on July 8, I gave an overview of the numbers of animals that are impacted by human activity. I tried to provide the audience with a sense of scale when it comes to the potential capacity for animal suffering, including touching on the suffering of animals in the wild. In our 15-year history, Faunalytics has always tried to remain mostly “issue agnostic.” That is, we’re willing to help anyone who is sincerely trying to save animals and has an idea with a reasonable chance of success. That’s why we’ve been honored to help a wide variety of organizations working on a range of important animal issues. At the same time, we recognize that numbers matter. Scope matters. Most of our independent work has therefore centered on the use of animals for food. The animals (and their byproducts) that end up on our plates represent more than 98% of the animals that suffer at human hands. But we think it’s worth taking a close look at the statistics associated with each major animal issue. Despite the magnitude of the numbers discussed below, it’s important to remember that these stats represent individual lives. In every case we’re talking about actual animals who are capable of thought, emotion, and pain. In addition to domestic cats, the feral and free-roaming cat population may be as large as 70 million. Arguably, those cats could be classified as either companion animals or wildlife, depending on circumstances. If many of them were classified as companions, then we might have as many cats as birds “in” US homes. Under the umbrella of animals used in science are animals used for medical testing, product testing, dissection, etc. Starting with dissection, the National Anti-Vivisection Society estimates that 12 million animals are used annually for dissection in US high schools. That number is thought to be split evenly between vertebrates and invertebrates and does not include animals dissected in pre-high school or college biology courses. The most commonly dissected vertebrates are frogs, fetal pigs, and cats, while worms are the most commonly dissected invertebrates. For animals used in research laboratories, it’s a tale of two stories… or rather two datasets. Only some species of animals who are used in research are covered by the Animal Welfare Act (AWA), which means that their usage is monitored and tracked. In total, there were 767,622 AWA-covered animals reported to have been used in US research experiments in 2015, according to the USDA/APHIS (PDF file). Here’s how the figures break down. The good news is that the trend in usage of AWA-covered animals has been on the decline for almost 25 years (since about 1992). The bad news is that the decline has been more than offset by an increase in the number of AWA-excluded animals like mice, rats, and birds. Estimates from major anti-vivisection groups put the number at 20-90 million such animals used in research, and the upper estimate seems more likely. When combined with animals used in dissection, the total number is likely approaching 100 million animals used for “science” each year in the US. Instead of solid data on the number of animals fished, hunted, and trapped, we have only guesstimates. The US government tracks (PDF) the number of anglers (fishers), hunters, and trappers, with a focus on how much those activities impact the economy. But accurate information about the animals who are killed is unavailable. According to the US Fish and Wildlife Service, in 2011 there were 33 million anglers who spent 554 million days fishing and 14 million hunters who spent 282 million days hunting. For recreational fishing, we can make some very broad guesses as to the number of animals killed. For instance, if we assume anglers catch an average of three fishes per day spent fishing, the total number would be nearly 1.7 billion fishes. Even if half of those are caught and then released (which still inflicts pain and suffering), then the combined death toll for recreational fishing would be about 850 million fishes each year. When it comes to hunting, the data aren’t any better. One estimate from In Defense of Animals puts the total figure at 200 million animals. The details are not available, but the estimate was said to be compiled from state fish and wildlife reports on hunting activity, which totaled 100 million. IDA then multiplied the figure by two to account for animals that were hunted and killed, but not reported to a state agency. The range is likely between 100 and 200 million animals. If we assume hunters kill one animal every other day they spend hunting, then we would estimate about 140 million animals, which also falls within this range. According to Born Free USA, four million animals are trapped or fur each year in the US. This statistic doesn’t count the millions of animals farmed for their fur as well (for instance, nearly four million mink (PDF) were killed on US fur farms in 2014). Born Free USA also notes that millions more animals are killed for “wildlife management” purposes, mainly to protect animal farming and ranching operations as well as hunting lands. One estimate also notes that the US Wildlife Service agency killed more than four million animals in 2013, mostly birds. The number of animals that humans consume as food is staggering and eclipses all of the other statistics mentioned so far. In the US, more than 56 billion animals are killed for food each year. And that doesn’t even count egg-laying hens or dairy cows. What the statistic does include is nearly 47 billion fishes and shellfishes (mostly shrimp), almost nine billion chickens, and hundreds of millions of other farmed animals. These figures come from the USDA for chickens and other land animals (PDF files) and from the excellent Counting Animals blog for fishes and shellfishes. In addition to the confinement and slaughter of animals for meat, humans also consume a lot of eggs and dairy. According to the USDA, US farms currently (as of mid-2016, PDF) confine more than 300 million hens used for egg production and more than nine million cows used for milk production. While far fewer in number than the farmed animals who are consumed for their flesh (especially chickens and fishes), egg-laying hens and dairy cows endure constant confinement and a range of unique forms of abuse. While this blog is focused on the number of animals used in the US, it’s worth briefly mentioning the global statistics for animals used for food. According to the United Nations, 68 billion land animals were slaughtered worldwide in 2013, the latest year for which statistics are available. This is undoubtedly a conservative estimate given under-reporting for some species and some countries. When it comes to fishes, the UK-based organization Fish Count estimates the global commercial fishing industry kills 1-3 trillion animals each year. By now, some readers’ heads may be spinning. Don’t worry, you’re not alone. It’s hard for most people to conceptualize 70 million feral and free-roaming cats, let alone a trillion fishes caught and killed annually for food. These are huge numbers. Depending on the scope of your consideration and your feelings about suffering, however, the numbers might be much larger. That’s because a growing number of animal advocates believe humans should also intervene in all animal suffering, even when it occurs in nature without human influence. In a nutshell, there are A LOT of animals in the wild and most of them are fishes. In aggregate, these animals represent the potential capacity for suffering caused by humans, other animals, or nature. And it’s true that these animals already suffer greatly in nature, even if it’s not at the hands of humans. Additionally, Tomasik notes that there are more than a billion billion “bugs” (insects, spiders, worms, etc.) in the wild that advocates might also consider. I think it’s important for advocates to know these numbers. A big part of Faunalytics’ work is collecting and generating these kinds of data for animal advocates. Probably the most important reason to know the numbers is to guide our movement’s advocacy priorities. I believe it’s important to make progress on all animal issues, not just in one area. At the same time, the disparity in suffering is very large for different species and different situations. The numbers should at least partly guide our priorities. Consider this example from LessWrong.com: “Three groups of subjects were asked how much they would pay to save 2,000 / 20,000 / 200,000 migrating birds from drowning in uncovered oil ponds. The groups respectively answered $80, $78, and $88. This is scope insensitivity or scope neglect: the number of birds saved – the scope of the altruistic action – had little effect on willingness to pay.” This kind of irrational behavior drives economists (and animal advocates) nuts. 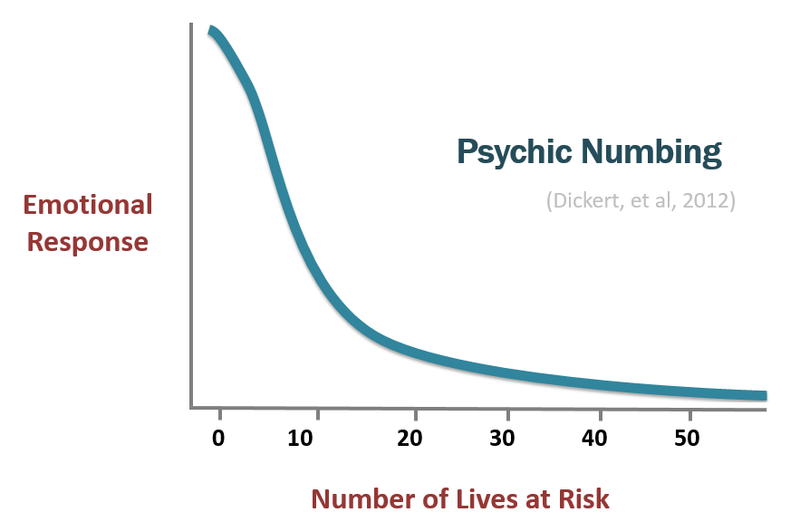 Dickert and his team use the term “psychic numbing” and describe the concept with the following chart. We know that most people are driven to take action based on some sort of emotional response. But psychic numbing tells us that the more lives are at risk, the smaller the emotional response. This is not to say that you should never use statistics, just that you should use them selectively. And for most people, focusing our advocacy messages on fewer (and more “identifiable”) victims is likely to be more effective. What are your thoughts on the use of statistics for animal advocacy? Do you have better sources of estimates than what we’ve shared here? Please comment!